Bugana Vintage Gold Tone Cigarette Lighter With Built In Watch Made In Lucerne Switzerland excellent working condition Condition is Used. Dispatched with Royal Mail 2nd Class. Flick up the lid and touch the front button to operate, this produces a single plasma arc to light your cigarette which is wind proof and difficult to blow out. Finished in polished black lacquer with silver accents. Vintage cigarette cases and match boxes (2 of each). Material is metal (1 is chromium plated) . Art deco retro smoking collectors. One of the cases is a Parker in excellent condition. Condition is Used. Additional note - these are up for auction elsewhere so may be removed early. Please see my other items for sale. 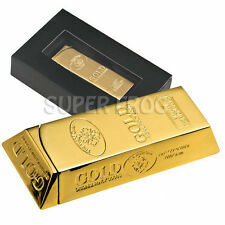 Who does not want to get a gold bar?. 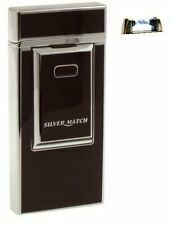 Smart automatic lighter in small gold bar shape. GOLD BAR LIGHTER. Double Ejection Lighter Case Box Holder Windproof Dispen New UJ IN BOXED. 36th Ulster Division cigarette lighter & gift case. Just needs a wick, flint and petrol to work. Condition is as per the pictures. 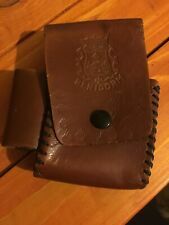 Stunning Vintage Retro Brown Tooled Leather with Genuine Fur Detail Cigarette Lighter Case Holder with Belt Loop. The leather has some colourful floral motif. You could use the case/holder as it is or worn on your belt. A great collector item! Belonged to my uncle and most probably came from USA. Approx from the late 1970s/early 1980s, in very good condition for its age. Just some minor wear to the front magnetic popper/fastener - Please See pics. It measures approx 5”x4” Please contact me if you have any questions. Thank you. 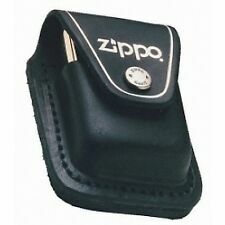 Harley-Davidson Motorcycles X Zippo lighter pouch. High quality belt loop case made of thick leather. Stylish black design with silver coloured printed Harley-Davidson logo to carry your Zippo lighter around safely. Flick up the lid and touch the front button to operate, this produces a single plasma arc to light your cigarette which is wind proof and difficult to blow out. Finished in polished black lacquer with gold accents. Slide up the switch and press the small button underneath to operate, this produces a single plasma arc to light your cigarette which is wind proof and difficult to blow out. Flick up the lid and touch the side button to operate, this produces a dual plasma arc to light your cigarette which is wind proof and difficult to blow out. This is a mid 20th century Ronson combined cigarette lighter & case. This unusual piece is chromium plated and in very good condition. The spring action door works well and the corners are without dents. Flick up the lid and touch the front button to operate, this produces a single plasma arc to light your cigarette which is wind proof and difficult to blow out. Cigarette Cases. Fancy Dress. Keep Calm I'm A Managing Director Mug Cup Gift Mug. Keep Calm I'm An Account Manager Blue Mug Cup. Fancy Dress Accessories. FANCY BROWN LEATHER CIGARETTE & LIGHTER CASE. 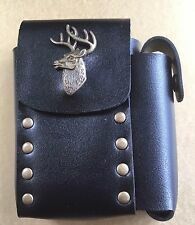 NEW LEATHER CIGARETTE CASE TIN HOLDER VARIOUS COLOURS STYLISH GIFT. JAPANESE PETROL SWAN TABLE LIGHTER. Condition is Used. Dispatched with Royal Mail 2nd Class.In good condition not tested. Leather lighter case . Leather - handmade buyer initial engraved. Leather lighter case. Condition is New. Dispatched with Royal Mail 2nd Class. BELIEVED TO BE MADE IN GERMANY MODEL AND CIGARETTE LIGHTER OF U BOAT 581. Vintage Quirky Novelty Cigarette Dispenser with Integral Lighter. Approximately 9" high by 5" square this is made out of brass, metal and cork lining. It weighs over 1.1 kilos. The only inscription is 'Foreign' under the base. The lighter has a wick in it which shows no sign of having been lit and fills from underneath. The clock-face is an illustration and not a timepiece. Please study the photographs to satisfy yourself about condition. Super King's Retro Cigarette LighterBlack and gold . Condition is Used. Dispatched with Royal Mail 1st Class. This cigarette lighter case is in very good condition. This item is sold as seen. Please see all photos for help with condition and description.